We are so lucky to have people in this world who care so much about the bees in this world. Dave Hunter is one of those people! If you have ever thought about keeping bees for your garden, but are afraid of being stung, or are just not into that space outfit you have to wear to collect honey, Mason Bees are a great alternative. I talked with Dave Hunter from Hunter's Mason Bees to give us a little insight on mason bees and how they are a great alternative to keeping honey bees for the average person. Here is a Q & A with Dave Hunter- thanks for all your hard work Dave! Tell us a little bit about your company and where you're located. Hunter’s Mason Bees is the foundation division of a new company that is developing a strategy to provide alternate pollination solutions for orchard and nut industries along the US west coast. With the honeybee in crisis and no apparent answers from the scientists and biologists, we are striving to provide a native & natural solution to assist keeping food on our tables. HMB’s primary insect today is the robust, yet simple to manage, mason bee (Osmia Lignaria). We’re headquartered in beautiful Woodinville, (WA)! When did you start having a passion for mason bees? Raising mason bees started out as a “fun” backyard hobby about twenty years ago. Always trying to do the right thing, I’ve continually looked to provide the best “home” for the mason bee. As my knowledge increased, I began to work in earnest with US scientists to ensure that I understood the mason bee’s idiosyncrasies and would be raising them as ethically as possible. I know that bees need to be "cleaned"- can the average person do this, or is it something we should leave up to the professionals? I don’t wash my mason bees… I have found there are better solutions available which the average person can learn! People feel a need to clean because of pest intrusion. Ridding the mason bees of pests should be the owner’s primary duty. My new company will help people learn these simple rules so they can have better success! Why are mason bees the best bees to keep for the backyard gardener? 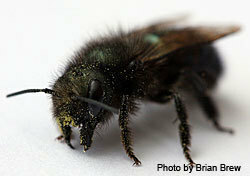 Mason bees are a magnificent native insect that rarely stings. It’s easily domesticated and is extremely beneficial for pollinating all fruit trees or food in bloom in March-May. In addition, it’s a wonderful educational example of how important pollination is to humankind. I find that there are two different “owners” of a mason bee colony: those that want a workhorse for pollinating their fruit trees, and those that want to watch and encourage a native pollinator to “do their thing” in a backyard. What are the best types of plants to keep in your yard for your mason bees? There are a variety of plants that the mason bee will forage on in their 6-8 week life span. In general, any pollen from a composite flower is great. (think dandelions!) Although this list is far from complete, good sources of pollen/nectar are big leaf maples, Pieris Japonica, quince, fruit trees, blueberries, and Oregon grape. I’ve seen them in my rhodies and azaleas as well! Do you think projects like this around the country could help solve the disappearing bee problem or CCD? While raising mason bees to pollinate orchards won’t solve CCD, using mason bees in orchards will offset that huge impact. Mason bees are a proven viable alternative, they’re relatively easy to manage, and should be welcome into any crop as a native solution. I believe over a few years, orchard managers will have read enough articles and heard of enough success stories to try mason bees out on their own. I’m here to help them succeed! Why did I not know about Mason bees? This is great information. I&#x27;ll have to do a little more research on my own- I know they are good for the Pacific NW, but wonder if they are good for the south...? Does anyone have any idea? I have mason bees in the fridge, awaiting warm temperatures... In Seattle, when would you recommend that we put the little guys outside to wake up? I would love to own bees but I was always afraid it would be such a huge time commitment- mason bees actually sound do-able. Thanks Dave for the info- it really clear a lot of things up about bees and possible solutions to the problems we are facing with them disappearing. Great information here- I have some fruit trees in my garden and this could be very helpful to have to make sure they get pollinated. Thank you for all of this- I will go to your website to learn more. I had no idea about mason bees and they sound like a great idea for keeping in your yard if you have kids and are afraid of them getting stung.